I hope everyone had a successful Halloween! My house actually hosted a party this year with the theme “fractured fairy tales.” Of course, the problem with concentrating so deeply on fairy tale-themed decorations for the two months prior to Halloween is the withdrawal you experience when the party is over. So naturally I purchased eight new fairy tale picture books and decided to blog about them. Yay! The stories, of course, can be traced back to Perrault, the Brothers Grimm, Anderson, etc., so it’s really the illustrations that make one picture book stand out over another: how and what an artist chooses to depict in an picture highlights what the artist thinks is important, or not, in the story. And that’s how I ended up with several versions of the same story—but it was totally worth it. There are some BEAUTIFULinterpretations out there! First, there are some obvious (but still amazing) illustrators like Paul O. Zelinsky and Ed Young. RUMPELSTILTSKIN (Caldecott Honor Award) and RAPUNZEL (Caldecott Medal) are the only two I own by Zelinsky and they have definitely grown on me over time. While I wasn’t immediately drawn to the realistic illustrations, I found myself fascinated with Zelinsky’s use of light and shadow and I’ve decided that the cover illustration of RAPUNZEL is one of the most fantastic drawings I’ve ever seen. From the cover alone you can tell the time of day, location and height of the tower, that the hair is significant…the list goes on. And Ed Young is amazing, too: I currently have LON PO PO: A RED-RIDING HOOD STORY FROM CHINA (Caldecott Medal) and YEH-SHEN: A CINDERELLA STORY FROM CHINA and they’re stunning. His images become a part of their environments, blending into the backgrounds of the illustrations and leaving room for the reader’s imagination to take over and complete the drawings. One fairy tale illustrator I was unaware of previous to my tirade on Amazon was Chihiro Iwasaki. THE LITTLE MERMAID arrived just yesterday and I’m already so in love with it that I’ve since purchased SNOW WHITE AND THE SEVEN LITTLE DWARVES and SWAN LAKE. Iwasaki often worked with Anthea Bell (a well-known translator) to create beautiful interpretations of fairy tales that are colorful, yet minimalistic at the same time with dark lines and soft water colors. Danie Egnéus’ LITTLE RED RIDING HOOD is kind of in the same vein, colorful yet minimal. It’s hands-down one of the most beautiful books I’ve ever seen, with washed-out images mixed with collages and heavy lines. It also has just the right level of creepiness which, if you find yourself interested, can also be seen in Camille Rose Garcia’s ALICE’S ADVENTURES IN WONDERLAND—totally awesome, but super creepy. Ok, so some quick shout-outs: Marcia Brown won the Caldecott Medal for her CINDERELLA (and rightfully so), and Paul Heins’ and Trina Schart Hyman’s SNOW WHITE is also notable. 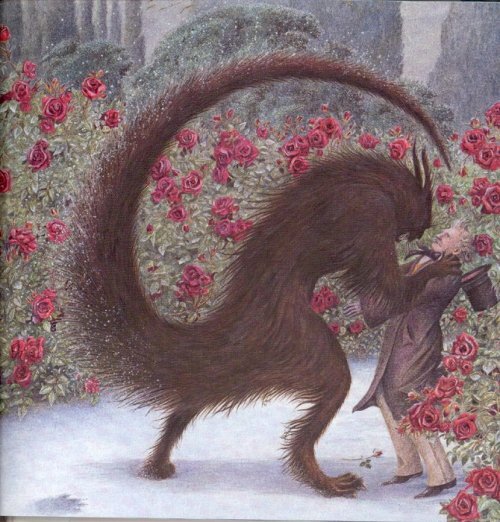 Finally, while I’m not a huge fan of Angela Barrett, her depiction of THE BEAST in BEAUTY & THE BEAST is phenomenal.